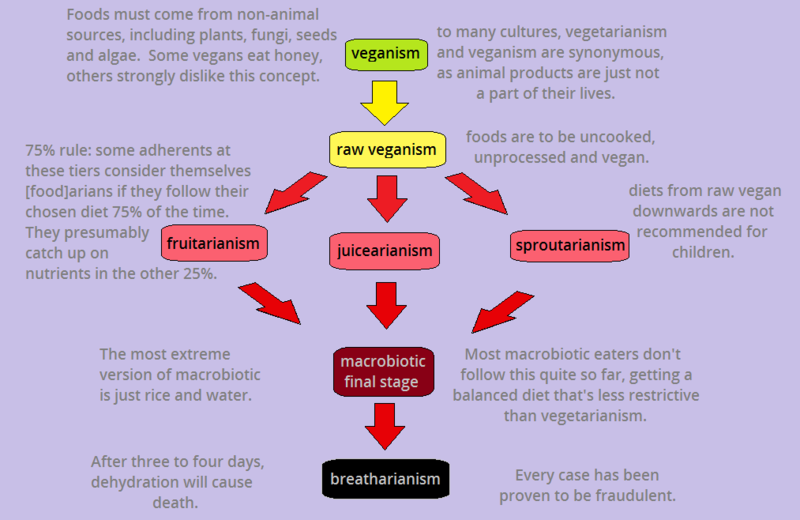 In this 5 part article series I am going to examine a range of restrictive diets branched downwards from Veganism. I have split it into five parts to make it readable and interesting, since the article is 12 pages long as I finish it off in Open Office, and that’s without the pictures. Veganism is awesome. I’m going to put that out there first of all, because I believe it is true. Next I’m going to state that at the time of writing, I am not currently a vegan (I have been in the past, and will be again in the future). I believe it is our natural state of existence, and that, whilst the transition to cooked meat was a necessary one, millions of years of evolution ago, we are now reaching a point where transitioning back away from meat eating is necessary for a plethora of reasons. I will discuss these somewhere else. What I want to talk about in this series are the diets that branch downwards from veganism in the “even more restrictive” state. Anything that includes foods that are not strictly vegan were not included because they wouldn’t branch downwards mathematically. Don’t understand? Try reading up on databases. 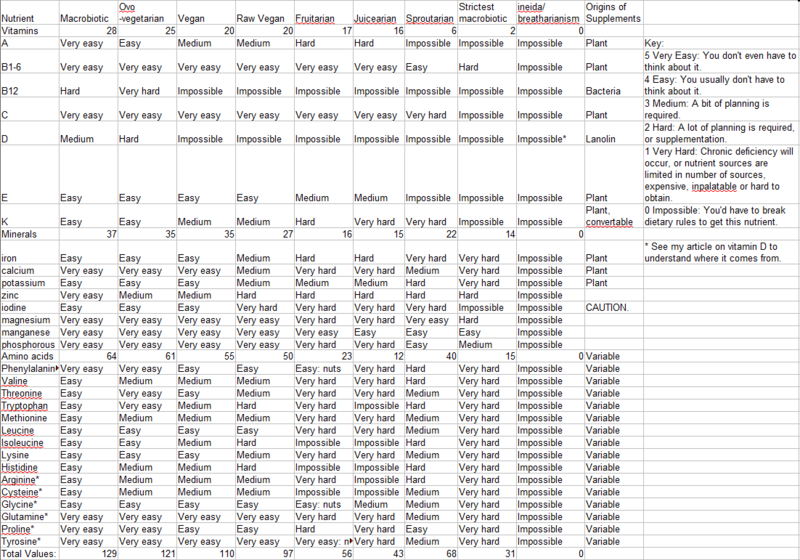 So we’re looking at the data set “diets that are considered at least vegan” and they are sorted in descending order of restrictiveness (see my delightful and informative infographic). The colours show how healthy/deadly each one is if you ate 100% like this permanently. This article assumes you understand the principles and ideology of what being vegan is about, as well as a basic idea of what it entails. If that’s not you, go and look it up. I’ll wait. All of these diets are discussed and explained in Viktoras Kulvinskas’ book Survival in the 21st Century: Planetary Healers Manual , a book written in 1975, now into its 34th edition at which point it abruptly went out of print. He also co-founded the Hippocrates Institute. Bear in mind when reading it that the body of knowledge about nutrition was vastly different, a lot of foods weren’t commercially available which are dietary staples nowadays, and the general diet of the omnivore and vegetarian were also quite different to what these groups eat now. I would argue that while some of his work is groundbreaking, particularly his “new diet” that was predominantly raw vegan, with significant amounts of fruit and sprouted seeds, at the same time, he thinks he has a scientific basis but doesn’t actually understand the underlying scientific principles, and some of what his book develops into is just plain ridiculous, like the concept that we are evolved to subsist on light and sound (the first mention of breatharianism I could come across). We have no means of converting either light or sound into energy. If you’re confused about the vitamin D connection, please read my article “The Mystery of Vitamin D” to find out how we make vitamin D – it’s not infused into our bodies by the sun, the sun does play a part but it doesn’t “synthesize” vitamin D as a lot of people believe. Raw food diets are really trending at the moment, and raw veganism, once the domain of tree-dwelling anorak-clad protesters is now becoming much more mainstream. If veganism is as out-there and uncommon as vegetarianism was 30 years ago, raw veganism is as common as veganism was five years ago. It’s much more talked about by people in social situations, although the conversations do still tend towards insecure ridicule in the “what are your shoes made of?” vein. As you can see from my table, Raw Veganism scored 97 for total nutritional value, compared to 110 for veganism and 121 for ovo-vegetarianism. The rules: Raw vegans do not eat or use any animal products, of course. The plant-based foods they do eat must not have been heated above 104-120F (40-49 degrees Celsius) at any point in their production cycle, and also must not contain certain additives deemed unfitting with the raw vegan philosophy. Some proponents advocate a 75% raw vegan lifestyle to ensure particular nutrients are still part of the daily diet, but many others state that their diet is as complete as a vegan one in terms of nutrition, therefore including 25% of cooked food makes no sense. I’m not in possession of any nutritional software, so couldn’t say who is right, although I do know the vitamin content of bell peppers changes when they’re cooked (I really want a program that accesses a database of nutrients; I could write one, but I’d need to populate a database with all known edible plants so I could use it wherever I was, so if you know of one that’s ready-made, or have made one that you’d like reviewing, drop me a line). Aside from not eating cooked food, the biggest difference between raw veganism and veganism is lack of soy-based products – staples such as tofu, soymilk, dairy free chocolate and cheese – because of the production methods. For me, that’s the main appeal because I feel like I can be overly dependent on soy, and I particularly was when I was vegan. Tofu is my favourite food ever but I wonder how many great things I’m missing out on because I gravitate towards tofu. See my table pictured above to see how raw veganism fares compared to other diets. The rationale: Some adherents dislike that food is damaged and devalued (nutritionally) by the cooking process. Others wish to eat as our evolutionary ancestors did. Others forgot to pay their electric bill then realised they didn’t need to (joking, but if this is you, what a cool way to make lemonade out of lemons). Others still find it is more in keeping with a nomadic, tent-dwelling lifestyle as they travel around experiencing new places – what is more enticing than pitching a tent in the pouring rain and NOT having to try and get a stove working? Whatever the reasoning, it will vary from person to person (“that’s right, we’re all individuals” – Monty Python). Their solution is to eat food that is closer to its original state. The drawbacks: According to some prominent ex-vegans, who are as quick to attack veganism as they are to stuff a hot dog in their face, raw veganism is deficient in certain nutrients. Vitamin K has been cited (see my upcoming article on Vitamin K – a.k.a. Vitamin Kale) as one deficiency. Vitamin D is the big one. Vitamin B12 is also mentioned by some. Your standard vegan criticisms. By and large, raw veganism when done sensibly with correct planning and eating for nutrition, not to satisfy a quota of bananas, will yield as much nutrition as a vegan diet, although some of the food quantities and varieties will need to be varied. The biggest problem with raw veganism is a distinct lack of cholesterol – essential for vitamin D synthesis. Vitamin D3 is a poorly understood and often forgotten little vitamin, which I have written another article about. Recent studies, outlined in my vitamin D article, show that within our lifetimes, a vegan vitamin D source will not only be able to be established, but also made on a large enough scale for everyone. Why is the research happening which underpins this? Because of the growing number of vegans, and their vitamin D deficiency – it has driven forward research, which will solve the problem very soon. Personally, I see no issue with supplementing with a vegetarian vitamin D source, and a vegan vitamin K source, if you need these vitamins. Vitamin A deficiency is quoted sometimes, but you can get provitamins A from vegetables such as carrots, and because we are not “true carnivores” like cats or dogs, we can convert the provitamin A into retinol, which is the bit we need, although we are not as efficient at this as “true herbivores.” Vitamin B12 deserves more consideration because it’s the source of more misinformation than any other concern-vitamin in the vegan diet. The vitamin B12 fallacy goes like this: “there’s no plant source of vitamin B12.” **WRING YOUR HANDS AND GRAB A SAUSAGE!! ** Here’s a shocker: There’s no animal source of vitamin B12 either. Or fungi. Let’s think back to high school biology: Of the five types of organism, plant, fungi, animal, archea and bacteria, only archea and bacteria can produce vitamin B12. These bacteria are usually found in your gut and most people don’t need supplementing. Vegans don’t specifically exclude bacteria from the diet, as this would be impossible unless everything they ate was bathed in strong chemicals prior to intake, so the classification of vitamin B12 as non-vegan is misleading pro-meat-eating sensationalism. Due to bacterial symbiosis (the interrelationship of bacteria with other organisms), there are sources such as chlorella (an algae, designated vegan source of B12 because they can make more money from labelling it “the only vegan B12 source” then charging you six times the price of the others), streptomyces griseus and pseudomonas dentrificans, both of which come from soil, not animals. It has been shown that smokers, users of oral contraceptives and many pharmaceutical products are all at risk of vitamin B12 deficiency due to them preventing absorption in the stomach. This is not seen as a health risk, presumably because there’s far too much money to be made by big (and small) pharma companies by selling you a drug that causes B12 deficiency and then selling you a B12 supplement, then selling you meat because they’ve convinced you to eat it again due to alleged B12 deficiency. Let me repeat: Vitamin B12 supplements are as vegan as home-made bread, licking your fingers or giving someone a kiss. Raw veganism has come under a lot of fire, and whilst I’m not actually a raw vegan, I got very fed up whilst reading for this article with the sheer amount of rabid-ex-vegans (no prefix to vegan, note, despite the fact they were all actually ex-raw-vegans and most of them hadn’t even ever been vegan) who couldn’t be bothered to use the correct title for the diet they were lambasting and who kept calling it veganism without distinguishing, as if invalidating one was to invalidate the other. You can find a lot of these people at letthemeatmeat.com (which I thought was Let The Meat Meat when I clicked through google, until I saw their website title). The lesson here is, don’t just eat what you can eat, eat what you need to eat, in the right quantities, in order to get your nutrients every day. Whilst researching the raw vegan diet, I did come across a video on Youtube which explained that one of the potential problems that the videomaker experienced was that she lost her period for several months. I fully agree with the lady in the video – if you lose your period, don’t ignore it. I am going to conclude (and remember I’m not a raw vegan) that raw veganism is a difficult to follow, but valid and nutritionally sound diet as long as it is followed by intelligent people who understand the concept of vitamins, minerals, and balanced diets, and aren’t afraid to supplement in a sensible way and shift their food values around to get the optimum balance for their own body, but that 75% raw sounds more achievable and sustainable over a longer period of time. The main thing to remember, though, is everyone is different, and people are affected differently by different diets, and it’s ok to stop following a particular diet (even if you were banging the loudest drum in favour of it) because it’s not working for you, there’s no shame in admitting that you need to eat differently, but that doesn’t mean that everyone else needs to eat differently too (eat being the operative word here).